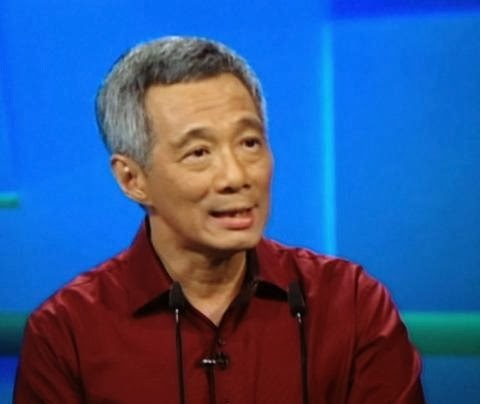 S M Ong: Backtracking 'Every school is a good school': What's the origin? Backtracking 'Every school is a good school': What's the origin? How many of our leaders and top officers who say that every school is a good school put their children in ordinary schools near their home? (Only) until they actually do so are parents going to buy (it). I'm not sure if it's heroic, but it's certainly brave in a career suicide kind of way, although I don't think she expected her remark to go viral. I want to point out that her remark has gone viral only because it was reported by The Straits Times, which is often criticised for being a Government mouthpiece. 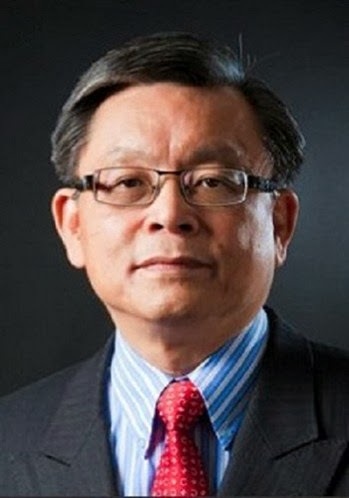 And The Straits Times reported it only because the remark was made at the AsiaEducationExpo, which is organised by Sphere Exhibits, which is owned by Singapore Press Holdings (SPH), which also owns The Straits Times. So really, SPH is the true hero here. Anyway, the viral remark got me curious: What is the origin of this "Every school is a good school" line? So I did some googling. Our education system caters to all students, and not just the most outstanding ones. Our schools go beyond book learning to teach students how to solve problems, and imbue them with sound moral values. We create multiple pathways for students of different abilities and interests to progress. We help every neighbourhood school to be a good school, with its own strengths and specialities. We identify and develop each student’s talents, and give him every opportunity to excel. It's not quite clear here whether he was saying every neighbourhood school was already a good school. It sounds to me more like a goal and a work in progress. ... we have a lot of resources, we can do a lot more for ourselves. We have got our education system sorted out. We can make every school a good school. Here, he made it clearer that the goal of "every school a good school" had not been achieved yet, but he believed it can be. 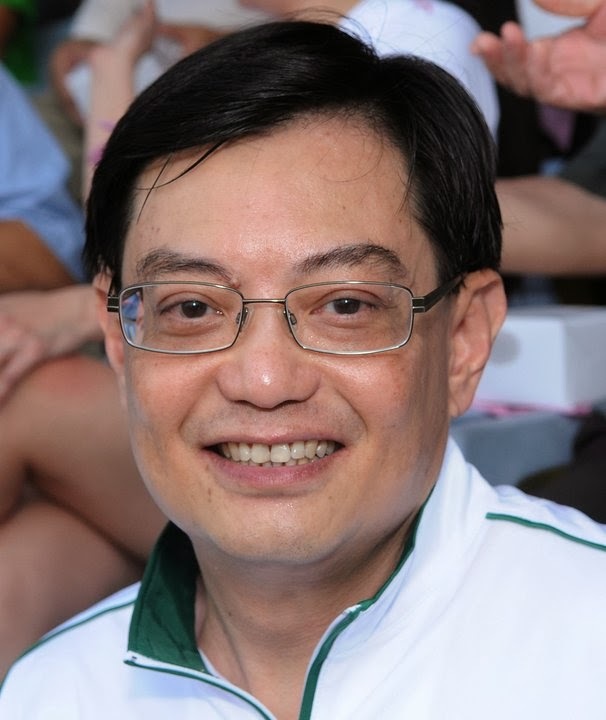 On 21 May 2011, Mr Heng Swee Keat became education minister, taking over from Mr Ng Eng Hen. As a system, we should not have “neighbourhood schools” almost as an apology. Instead, we must strive to ensure that all schools – in every neighbourhood – are good schools. Making his mission statement, Mr Heng was more or less just reiterating what the PM had said earlier. Nothing controversial about that, right? This year our team won the International Biology Olympiad. We hosted it and we won, the team first place, and the International Mathematics Olympiad which I think was in Buenos Aires, a Singaporean Lim Jeck from NUS Math and Science School was the top student. He came in first, with full marks, the only one to score full marks this year, first time it has happened. But we are not just focusing on the best students. Yes, we ought to celebrate our gold medalists, our outstanding ones, but our schools and teachers are also doing their best for every student, from the weakest to the most talented ones and that is why we say every school is a good school, every neighborhood you have a good school. And this is not just a slogan, this is a reality. So that was where the trouble started. "Every school is a good school" was no longer just a goal, but a "reality". But in contradiction to this, since then, Mr Heng has continued to use the line as a stated goal rather than a statement of fact. 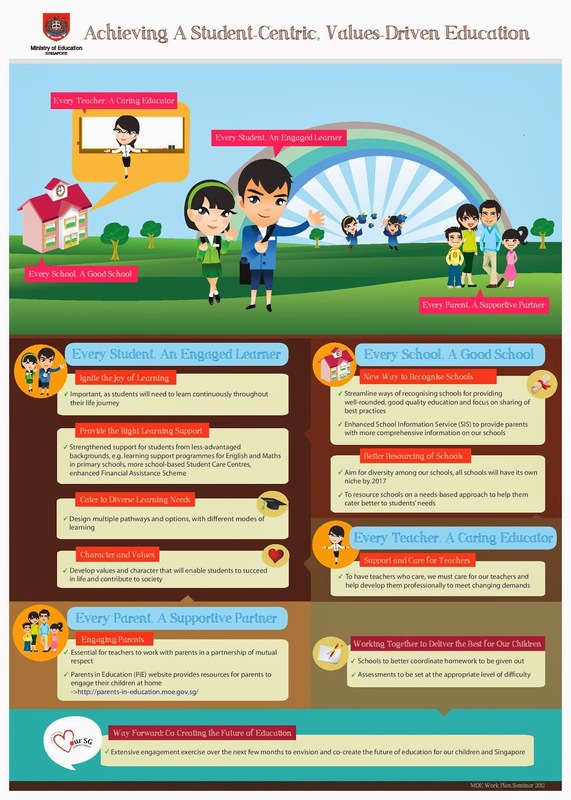 To enable every student to be an engaged learner, every school has to be a good school. For every school to be a good school, we cannot have cookie-cutter schools. But the perception that the education minister said "Every school is a good school" as a fact persists and continues to be perpetuated. Is every school a good school? It should be but it is not. This statement is not to demean the enormous hard work put in by school principals and teachers to help their students but is an indictment against the education system made bad by wrong policies. Much needs to be done policy-wise before every school becomes a good school. The first step for the education minister to take is not to pretend that every school is a good school. He will then re-discover what his school teachers used to tell him and what teachers everywhere tell their pupils, that honesty is the best policy. Yes, every school is a good school - but some schools are better. There are two different perspectives on education, on schools in Singapore. One is the MOE perspective - every school is a good school. I believe we can make every school a good school and we have done a lot of that to ensure that every school provides a good education for the students. We give them the resources, we give them the good teachers, we emphasise values and we have made a lot of progress towards this goal... So every school is a good school and I push MOE very hard to give the schools the resources, the good principals, the flexibility, the authority to teach students according to their students’ needs, to make the system work. This seems more consistent with what Mr Heng has been saying all along. So now "Every school is a good school" is back to being a goal and is not yet a "reality", even for PM Lee. You may have learnt from the papers on Saturday that I will be sending some of our most experienced and well regarded principals to head schools in our heartland. This is one of the many ways in which we are working hard to make every school a good school. Again, it's a stated goal, not a statement of fact. There are no such things as elite schools. All schools are the same. Therefore, I will make sure that the bestest of the principals will now be posted to the worstest of schools. Remember what I say, there's no elite schools. They are all the same. The problem is I couldn't find this quote anywhere else. I realised the quote is made up by the writer imagining what Mr Heng was saying, not what he actually said. I don't think a minister would use words like "bestest" and "worstest". That's just not cricket. I mean, you can interpret and/or disagree with what someone is saying, but you can't put words in his mouth. The trouble is even when the quote is accurate, the intended meaning can be lost. 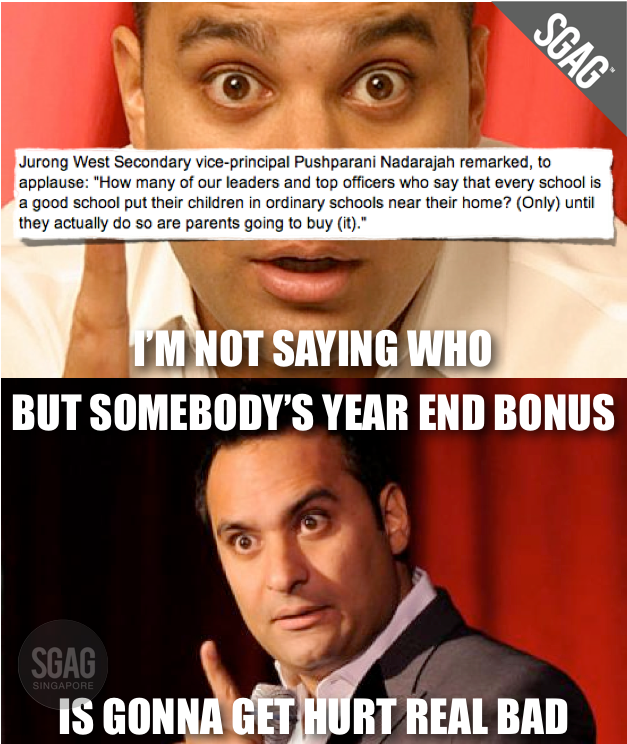 Yes, the Jurong West Secondary School vice-principal did quote "our leaders" correctly. They did say "Every school is a good school", but I don't think they meant it the way she's saying they meant it. Well, except for that one time at last year's National Day Rally.